Let me begin by saying this is an amazing book. For anyone who has any interest in the Kennedy assassination it is a MUST read if only for the shocking revelation at the end. The story is a very believable (albeit unbelieveable) account by Mr. Haslam of his research into a secret program headed by a prominent cancer doctor by the name of Mary Sherman. The purpose of the program was to create a fast-acting, lethal cancer-causing virus, by genetically mutating monkey viruses with the ultimate goal of killing Fidel Castro! Sound familiar? Well, all hell breaks loose when a number of these viruses find their way into the first few years of Salk polio vaccinations given to millions of American children in the late 50s and early 60s. Got your attention yet? Maybe one of the most astonishing aspects to this story is that Mary Sherman’s boss, a major player in national cancer research, provides her with an errand boy from a prominent Mafia Don in New Orleans. The name of this errand boy? Lee Harvey Oswald! I hesitate to give away the whole story, but by the end of this book you will have some very radical new ideas about not only the Kennedy assassination, but also the possible origin of several cancers which plague the boomer generation. I have to say it again, this is a fascinating book! ~ by Eric Harrington on September 22, 2008. This book may be difficult to comprehend for the uninitiated, but it is carefully and plausibly presented. With a forward by UFO and 9/11 journalist Jim Marrs, photographs and other documentation, I’ve yet to hear these theories refuted. Several of the characters involved have indeed been filmed and interviewed, corroboarating some of Haslam’s testimony. Anyone familiar with the books of Dr. Leonard Horowitz, especially “Death in the Air” will immediately recognize this program as part of a larger agenda. Recently Project Camelot interviews corroborated the Horowitz’ premise…and while the initial funding and objective of the bio-warfare program MAY have been to facilitate the Castron assasination, there were most likely far more sinister objectives afoot. 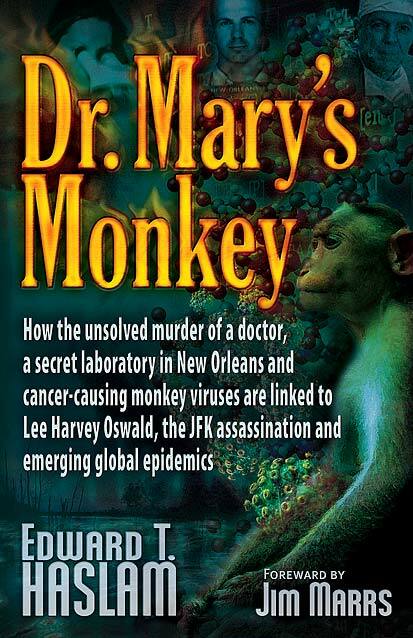 I wrote about Judyth Vary Baker and her relationship to Lee Harvey Oswald in DR. MARY’S MONKEY. Her new book ME & LEE will be published in November 2009 and can be pre-ordered from LeeHarveyOswald.info or JudythVaryBaker.com. Ed, I heard you on the show tonight as well as Judyth. May God bless you for the arduous and dangerous task of research nececessary to provide such stunning disclosure. I feel so bad. While helping my son study for a 5th grade history test, the question “who killed JFK” was on the study guide and the “correct” answer was LHO. Thankyou for your work. Hi Ed, When will I get my signed copy……and how are you? To say that reading this book has changed me forever would be a gross understatement… When I read the cover of this book I expected something very far fetched. I could not put it down and read it cover to cover in one sitting. Everyone should read This Book. I have all of my friends and family reading it and mention it to complete strangers. Thank you Mr. Edward Haslam and all of the people who helped to make this book possible.